I’m in a Tony Shaloub groove. He’s been in some real stinkers (Spy Kids, example) but with great film and TV like Cars, Monk and Feed the Fish, Shaloub rises to great heights. These aren’t Academy Award Winners by any means, but they certainly allow Tony to create characters that are quirky and rich. 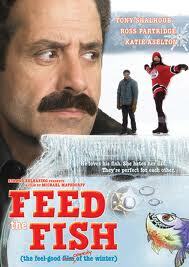 Currently streaming on Netflix, Feed the Fish is a movie that is creative in spots, funny in others, moving in one. Look for the crotch eating badger, the fishing poet, and the romp in the snowy drive-in movie theater. I wouldn’t need to watch it again but I recommend it for cold Saturday mornings.